Planting Fall Onions - How To Plant This Fall For A Great Harvest Next Year! Planting fall onions is a great way to have an earlier crop of larger, more robust onions early next summer! Planting in the fall allows onions to easily become established in the cool temperatures of autumn. The bulbs then go dormant for winter, and come back to life in early spring. That late fall growth gives them a big head start over spring-planted onions – making them ready to mature and harvest much faster. Best of all, planting fall onions is easy! When planting fall onions, the timing of planting all depends on where you live. Onions can usually be planted around the same time you plant fall garlic. Both crops need around 4 to 6 weeks of growth before a hard freeze or heavy frosts set in. As an example, if you live in an area where November starts to see the true cold winter temperatures arrive, you will want to plant mid-September. This allows enough time for the crop to settle in. If you are unsure of your average freeze and frost dates, your local extension agent is always a great resource. 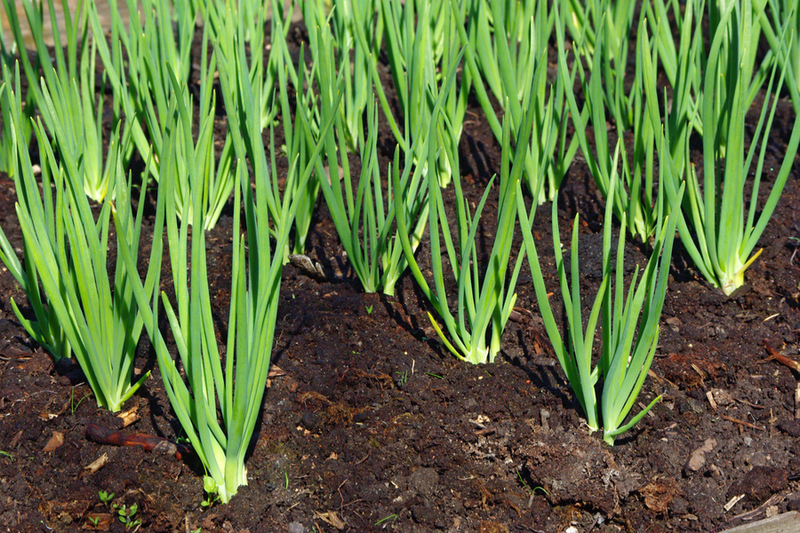 When planting in the spring, onions can be planted by seed or with bulbs (onion sets). For fall planting, it is best to use sets. Onions seeds simply take too long to become established for a fall planting. If you do choose to try the seed route, you will need to plant at least 8 to 10 weeks before your hard freeze date. When planting sets, the trench method works best. Dig a trench in the soil one to two inches wide, and to a depth of two inches. This allows plenty of space for loose soil and good early growth. Planting Fall onions will lead to an earlier harvest. Next, fill the trench two-thirds full of compost. The rich, fertile compost will help bulbs germinate quickly, and provide plenty of nutrients for good growth. Plant bulbs with the point end up, setting each bulb about half way down into the layer of compost. Space the onions approximately 4″ to 6″ apart to allow plenty of room for growth. Fill in the trench with the remaining soil to cover the bulbs and water. When planted, the bulbs should be covered in full with about 1/2 to 3/4 inch of soil. Immediately after planting, mulch the soil with a thin layer of straw or shredded leaves. This will help keep competing weeds at bay. More importantly, it helps keep moisture in the soil to help with the germination process. Once seedlings emerge through the ground, add a bit more mulch to provide full protection. Be sure to water at least every few days for the first few weeks until established. As the cold weather approaches, apply a few more inches of straw or shredded leaves to help insulate the crop for the winter. The onions will go dormant after a few hard freezes. They will remain that way until spring when they begin to grow again. For more great vegetable garden ideas, check out our Vegetable Garden Category on the website.